is a Partner at Vargo PT and the Clinical Director of the Northridge Vargo PT clinic. 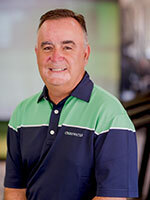 He has been practicing physical therapy as a licensed Physical Therapist since 1993. A former collegiate baseball pitcher, he in now a sports physical therapist, specializing in baseball-related injuries including elbow and shoulder issues. Mr. Feeley holds a bachelor’s degree in health education and physical therapy from California State University, Northridge. He began his work as a physical therapist in acute care. After his tenure there and after working at a number of other outpatient physical therapy clinics Mr. Feeley opened his own practice. Mr. Feeley opened the Northridge office in 2001. He created a clinic that delivered great service which he defined as taking time to listen to each patient in order to focus on what they needed -- not what they could do -- to develop treatment plans which would be successful. He also put a high value on hands-on therapy which he believes yields better results. This treatment philosophy was widely popular in the community. In 2004 Mr. Feeley made the decision to merge with Vargo PT. Mr. Feeley is ASTYM certified. He is married with two daughters. He enjoys his kids, their sporting activities as well as golfing in his free time.